Hello. I am glad to be back here. I must apologize for the break in our regularly scheduled program last week. I was in Seattle with a dear friend, wining and dining and walking about the city. We devoured our bread and butter and nearly stole our neighbours' while enjoying a fantastic Valentine's day supper at Le Pichet. The following day we had a simple but stunning lunch in the gorgeous white-washed Boat Street Kitchen. Everywhere we went we received exceptional service. It was an excellent trip! Now to the matter at hand - what to talk about today? I just realized that in the past week I have consumed an extraordinary amount of liver. I have eaten no less than four different types - chicken, duck, rabbit and goose. The rabbit was certainly the most surprising and, not surprisingly, the goose was the most delicious. As in all-out, complete, utter bliss. Sigh. Foie gras. I get dreamy-eyed just thinking about it. But, despite my predilection for liver, I also love greens. I seem to particularly covet the ones that are hard to find, at least in most grocery stores. I crave yellow flowering kale buds, crinkly cauliflower leaves and sharp turnip greens. I love pulling these from their stalks and nibbling on them immediately - raw, crisp and pungent. But, with no garden this year and markets months away from opening, I am in an unfortunate predicament. As it stands, I have not even had any kale this year. A shame. Some may even say a dirty, rotten shame. Just a couple blocks down the street there is a beautiful garden laid out in the front yard. There are two towering Tuscan kale plants (my favourite! ), several rows of cabbage, and cauliflower that has gone to seed, billowing into yellowed florets. Every time I walk or bike or pass by this garden I get dreamy-eyed, even though it isn't foie gras. Well, on Saturday, I decided to be brave. I had brought home a lovely, baby loaf of whole-wheat bread from the bakery I work at. It was simply too cute to leave behind. I mulled over whether I should give it to a friend or make itty-bitty sandwiches with it or maybe just cuddle it to death. Anyway, I was also planning on making a bean curry for supper, from my new Nigel Slater cookbook Tender. This particular curry called for handfuls of leafy soft green cabbage (such as spring greens) to be steamed or blanched before being stirred into the curry as the final coup de grace. I contemplated where I might find the most marvelous, frilly-leaved cabbage at this time of the year. I decided that Village Family Marketplace might be just the ticket - they often sell tiny, beautiful (albeit expensive) local vegetables - and if that proved fruitless (or should I say vegetableless?) I could try the Market on Yates. I saddled up my pony, by which I mean bike, and as I rode past the garden it hit me. A barter! Yes, I could trade my bread for their greens. I have always been a proponent, if not a practitioner, of bartering. I was scared though. Who were those people? Would they think I was absolutely ridiculous approaching them with such a proposition? I didn't even have the bread on me. I kept pedalling. Village Family Marketplace was closed (I actually suspect they may be going out of business) and what was on offer at the Market on Yates looked awful. So, just before my final destination, I stopped. I propped my bike against a tree and marched up the steps, heart pounding. I noticed the pile of cigarette butts and the chipped paint, the doorbell dangling from a wire and gulped. I knocked. No one answered. I knocked again but nothing. I sighed and went home. Awhile later I started my supper. It is always pleasurable to assemble curries. I sliced half-moons of onions and softened them slowly, rhythmically. I cracked spices, toasted them, and as I ground them, inhaled the wafting fragrance. Tomatoes crackled and hissed when I scraped the browned bits from the bottom of the pan. Finally, there was nothing left to do but perch the lid askance and let the curry burble and blip for half an hour. I still needed my greens though and resolved to try my luck again. If no one was home this time, well then I'd just go to Fairway and get a regular, old cabbage. But when I approached the house a light was on. I knocked and this time the door was answered by a friendly, young, completely unfrightening guy. I introduced myself, complimented the burgeoning garden, mentioned I worked at a bakery, had brought home an adorable loaf of bread, was cooking a curry, would love some greens, could we trade? It was far more rambling and incoherent that that, at least on my part, but that was the jist of what I said. The guy looked a bit perplexed. He explained that it was his sister's garden and that he really didn't have much to do with it. He asked to see the bread and agreed that it was pretty darn cute. He looked thoughtful. Finally, he said what I'd hoped he'd say - Yeah, sure, why not. We stood on the front steps and talked, small talk, and the sky was changing from pale blue to deep purple and the last golden bits of the sun were scraping against the bare branches and power lines around us and it was so great. I came home with a bundle of cabbage leaves and a wild, uncontrollable grin. The vivid, bright-green cabbage looked beautiful atop the luscious, yellow-beaned, red-juiced curry. No recipe this week. Just possibility. Be brave. A secret thrill builds inside of me, in Victoria, when August winds to a close. Wherefore? Apples. They start appearing everywhere: behemoths the size of 5-pin bowling balls; dignified russet varieties; puckery crab apples; tiny, green orbs camouflaged by leaves. Red, yellow, orange, no, not blue. Prospective trees will dangle branches, drooping with apples, tantalizingly over fences or sidewalks. When I spot such a tree, I stop, and very furtively, very sneakily slip as many apples into my backpack as I can, my eyes darting wildly, my breath baited. The thing is I don't really need that many apples. I volunteer with the LifeCycles Fruit Tree Project and bring home boxes heaped full of them. I go to Dan's Market and buy every single kind for sale. It does seem silly to pay for apples when I can collect enough to last me until February. (I do not exaggerate). Last year, to cope with my windfall, I ate at least three every day, and that was just out of hand. Dozens more found themselves partnered with pork chops, pancakes, sausage, or sweet potato. And let's not forget about dessert. Ooh-de-la-lay! Apple crisps, crumbles, cobblers. Did I mention cakes? I also really love apple cake. My purported mission is to discover the pinnacle of all apple cakes. Actually, I've already found perfection, more or less, but that doesn't end my search. You'd be amazed at how many different renditions of apple cake there are: delicate, dainty, meringue-topped, cream-cheese frosted, caramel-glazed, rough-crumbed, rugged, nutty. Anyway, while I revelled in my apple bounty, there was one thing I never tried: baked apples. Yes, perhaps the simplest, the easiest, the purest of all apple desserts. What was I thinking? I mean, I never doubted that baked apples were delicious. Stuffed with butter, sugar and cinnamon, how could they not be? But, people, I had no idea what I was missing. First of all, the apples bake peacefully and slow, which leaves you with plenty of time to do the dishes or read a book. Whilst cooking they send out the most enticing aroma that all apples do. They emerge from the oven frothed at the edges, rosy and golden, in a pool of bubbling, cinnamon-scented juices. You add generous scoops of vanilla ice cream and the contrast between hot, sweet apple and cold, velvety ice cream is nothing short of sublime. But wait! There's more. I had the particular good fortune of using this recipe as my introduction to baked apples. Jennifer Danter writes a column called Local Kitchen for EAT Magazine, a Victoria-area food magazine, and while I've always drooled over her lovely looking menus I'd never actually tried one of her recipes. Well. Thankfully, that's been amended. In this recipe standard baked apples are topped with shards of hazelnut-fennel brittle. Hazelnuts are, by far, my favourite nut but you could swap them for another, depending on your preference. The brittle uses a combination of sugar and honey - the latter contributes a complex but subtle sweetness. I used a golden clover honey but, again, you could choose another type - say a dark buckwheat honey - which would create a completely different flavour profile. The fennel provides a sophisticated black licorice taste while flaky sea salt makes everything pop. All in all, the brittle adds a necessary sharpness and crunch that would otherwise be missing in the gently yielding apples and melting ice cream. The final dessert is a delightful balance between sweet and savoury, sort of like a seductive, grown-up candied apple. I imagine you could do all kinds of things with this recipe. You might swap out the hazelnuts for your favourite nut or use a different variety of honey when making the brittle. I used fleur de sel (a flaky French sea salt) here and a bit more than the 1/4 tsp originally called for. Salt to your own taste. You could also experiment with different types of fancy salt as well. Make sure you choose apples that hold their shape in the oven. I used Jonagolds which worked well but some apples, particularly ones you've simply picked from a tree (and don't know the variety of), can disintegrate as soon as heat is applied. Experiment to find a suitable candidate for baking. I found that using 3/4 cup of brown sugar resulted in an overly sweet baked apple. I would use maybe 1/2 cup of brown sugar next time. But, sweeten to your own taste and, of course, depending on what apples you choose. You might also substitute maple syrup or honey for the brown sugar. Or you could tweak the apple stuffing as you please. I think that some orange juice and zest would be a good addition, especially when the fennel brittle enters the equation. Go wild! For the brittle: Coarsely chop the hazelnuts; measure out 1/3 cup and set aside. Finely chop the remaining nuts and set aside for the apples. Line a large baking sheet with parchment paper or a Silpat. In a heavy, medium saucepan combine the sugar, water, honey and salt over low heat until dissolved. Try not to stir too much or crystals may develop. When the elements are one, increase the heat to medium. The mixture will start to boil and bubble. Occasionally swirl the pan to promote even cooking. 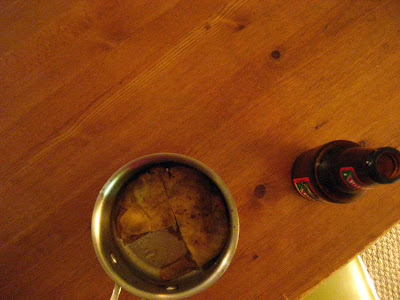 When the mixture has turned a light amber, after 4 or 5 minutes, pour onto the prepared baking sheet. Tilt the baking sheet so as to spread out the caramel as thinly as possible. Sprinkle with the coarsely chopped nuts and fennel seeds. Let cool completely before breaking into shards. For the apples: Preheat the oven to 375 F.
Mix the dark brown sugar, cinnamon and finely chopped nuts in a bowl. If the apples don’t sit flat, trim them so they do. Core the apples. This is easiest with a melon baller but you can make do with a paring knife and small spoon. Peel a 1/2-inch ring around the middle of the apples. Score this ring. Stuff the apples with the sugar mixture. Press 1 tsp of butter into the top of each. Place in a 9 by 13-inch baking dish. Pour in ¼ cup water, cover and bake for 40 minutes. Uncover and continue to bake until very tender, 10 to 20 minutes more. Check with a sharp knife that they are soft all the way through. Serve with vanilla ice cream and the hazelnut-fennel brittle. My, my, has a week already gone by? Things have been busy here. There was packing, moving, cleaning, working, and farewell forties of rye. A bit of cooking too, thank goodness. Last week I said we’d talk about cabbage and I think today is the day! It is a little dreary outside and rather cold in my new abode. Cabbage weather. Two years ago I realized I had a passion for cabbage. It must have started when I discovered the power of the braise. I could create a tangle of braised red cabbage (heady with caraway, hiding pockets of sweet apple) that I would eat hot, warm or even cold. 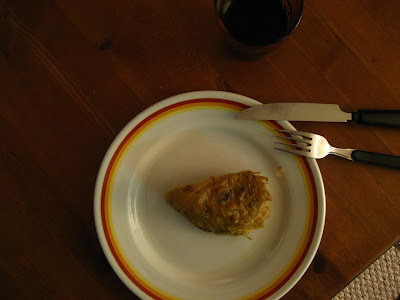 If I was patient, a rich braised green cabbage, so tender it simply fell apart, was mine for the eating. I had no idea vegetables could be like that. I was smitten. Later, my friend Patrick and I were talking cabbage and he showed me his dog-eared James Barber cookbook. Those of you who grew up in Canada, say twenty years ago, will remember him as The Urban Peasant. He pottered about on his TV show and wrote about good food. You know, the stuff that isn’t complicated or expensive or even looks very good, for that matter, but tastes delicious. The cookbook was filled with chapters like “The Forgotten Art of Generous Cooking” and “Immodest but Honest Eating”, each with rambling anecdotes that encouraged improvisation and admonished rules. One such chapter was called “Cabbage – The Closet Vegetable”. It was a delight to read. Did you know that in France “the nicest thing you can call your best beloved is mon petit chou (my little cabbage)”? Smitten again. Barber explained that the simplest cabbage dish he knew contained a mere three ingredients but was good enough to serve to company. I was intrigued. When he mentioned he also “enjoyed a slab of it cold after getting home at three in the morning” I was sold. I made it for myself, dividing the recipe by six (oh, lost art of generous cooking! ), in my smallest pot and with the best sausage I could find. The cabbage and sausage slowly melded together to produce something much, much greater than the sum of its parts. It smelled wonderful and it was so easy. Three ingredients! I had it with a cold beer and later (and this is the best of it) a wedge cold, straight from the fridge. What more can you ask for? I know it ain't pretty but it's delicious. This is an expression of cabbage at its finest. Rustic, simple peasant food of the tastiest order. Mr. Barber puts it best so what follows are his faithful instructions. Hear, hear! Slit the sausages, giving the skins to the cat, and crumble the meat. Slice the cabbage crosswise and drop it into boiling, salted water for exactly three minutes. Run it under cold water to stop the cooking process, drain it well and remove the hard centre core. Butter a pot and layer about one-third of the cabbage over the bottom. Salt lightly and pepper generously. Place about half of the crumbled sausage meat over the cabbage, cover it with another third of the cabbage, salt and pepper it again, add the rest of the sausage meat and finish with the remainder of the cabbage and a little more salt and pepper. Dot with butter, cover tightly and either bake at 350 F or simmer very gently on top of the stove for three hours. Chinese cabbage will take about two hours and savoy about two and a half. Cut into wedges and serve, preferably on a cold winter’s night, with beer or cheap Hungarian red wine – cheap enough to stain your teeth.